at times one wonders why diluted homoeopathic remedies have more potential to cure diseases than the concentrated ones? This intriguing question has disturbed many, but now researchers at the Kwangju Institute of Science and Technology, South Korea, have found an answer. 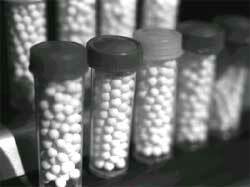 When homoeopathic medicines are prepared, they are diluted many times. Therefore, these medicines do not have the molecules of their original compounds, but just an 'imprint' of them. Ironically, homoeopaths have never been able to explain how these medicines, which do not have any traces of the original compound, still act as wonder drugs. The Kwangju research explains how this is possible. Shashadhar Samal and Kurt E Geckeler carried out research on a material called fullerene, which has medicinal potential. While studying the aggregation behaviour of fullerene derivatives in water, they found that its aggregates grew bigger as the solution was further diluted. Considering it to be an experimental error, they repeated the tests but got the same result. They then studied the behaviour of molecules such as nucleic acids, common salt and cyclodextrin, a sugar. They found that the phenomenon was common to all these chemicals as well. They double-checked the formation of aggregates by spreading the solution over slides and seeing them under scanning electron microscope. In diluted solution, the aggregates were nearly 10 times larger than those found in the original solution and the molecules got together in irregular bunches. The present finding reveals that diluting the remedies more might be increasing the size of the aggregates, thereby, making them biologically active. Also, larger clusters might be able to interact more easily with the tissues. The findings negate the general theory that in diluted solutions, molecules are spread out far apart but supports the theory on which the homoeopathic medicines work. The researchers also found that aggregates were formed only in polar solvents like water, which has different charges on both ends of the molecules. Therefore, the research also explains why only polar solutions are used for diluting homoeopathic medicines, says Peter Fisher, director of medical research at the Royal London Homoeopathic Hospital, the uk . "The research does seem to give some elements of interest in relation to potencies in homoeopathy," feels Anthony Bickley, principal of British School of Homoeopathy, Devon, the uk . But he feels that it fails to explain other mysteries of homoeopathy and cautions against over excitement. Even the authors feel that the discovery does not explain the science behind the homoeopathic medicines fully but lays a foundation for a new line of thought. "Homoeopathic medicines are more diluted than the solutions we used for our experiments," says Samal. "The laser light scattering equipment that is used for measuring the size of aggregates does not provide reliable data when the solutions are very diluted and this makes it impossible to actually check the process of aggregation in the medicine itself," explains Geckeler.